Hola! Flip Flop Learning was created by Senora Gose a former Texas Public School Teacher, current Private Lessons teacher, small business owner, blogger, and mother of five children. Flip Flop Learning offers a full Spanish curriculum, Spanish and French workbooks, flash cards, apps and more. Flip Flop Learning makes learning a foreign language fun for the entire family through a simple easy to use curriculum that provides fun activities and more! I met Senora Gose at a homeschool convention earlier this year and was very intrigued by the curriculum. It looked like so much fun! 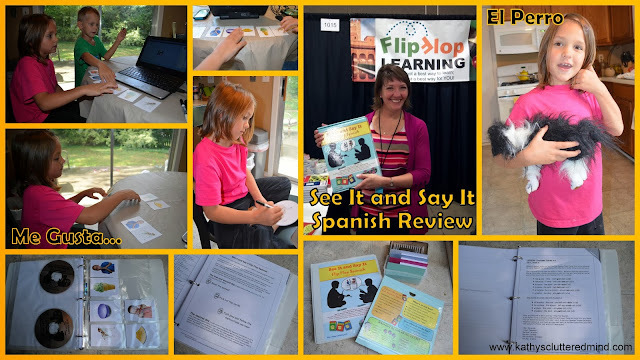 So I was very happy when we received See It and Say It Flip Flop Spanish from Flip Flop Learning to review. Spanish is definitely a language I feel everyone should at least know how to speak and understand. Not necessarily fluently but enough to hold a basic conversation. We live in Atlanta, GA which has a very high Hispanic population and my sister in law is half Puerto Rican so for our family we feel it is very important for the children to not only understand the Hispanic culture but also learn how to communicate with them in their native language. Just yesterday we were helping give a tour to some some seniors at the horse farm we volunteer at. There was two Hispanic ladies communicating in Spanish to each other. My son was listening intently to every word and after a moment he said with great pride, "we are learning to speak Spanish, hola, uno, dos, tres." He was very proud of himself and the ladies were too! See It Say It Flip Flop Spanish is a 2 year, hands-on Spanish curriculum perfect for the entire family, ages 3 and up. You will learn how to speak, understand as well as write and read Spanish. You will learn 250+ words and thousands of sentences. All three learning styles auditory, tactile and visual are incorporated into the program. The program is very versatile and perfect for on the go families. -Index card holder this helped keep our cards more organized but rubber-bands or ziplock baggies work well too. Literally you can open the box and get started in just 3 easy steps with little preparation. Just set up the binder, open to lesson 1 and lay out the first 6 flash cards then play CD 1! And that is just what I did the first time to see how easy it really was to use. Guess what? It was easy and we had our first lesson the same day the package arrived. I will note that I did go back through the beginning of the manual later that day. There is a Quick-Look Guide that breaks down all 45 lessons (very helpful for planning purposes). Lessons are divided into 4 semesters (with breaks worked in), there is a handy chart in the manual showing the recommended breakdown. The program is very flexible though and can be adjusted as needed to fit your family's needs. Older children may move through the program at a faster pace and will also learn to write out Spanish words and sentences for an added challenge. I also listened to the very first Track on CD 1 which explains in further detail how to use the program. You are also directed to view and listen to the Spanish enrichment page which helps with pronouncing vowel sounds and learning 10 conversational phrases (Track 31 CD 4). Each weekly lesson is super easy to follow and each lesson follows a similar format. I love how consistent the lessons are so you always know what to expect and don't need to spend lots of time preparing in advance. 1) Read the manual. Directions are printed in a nice large font and easy to read and follow. It literally only takes a few minutes to read over the lesson to prepare. 2) Select the flash cards for the lesson (generally between 4-6 flash cards) You can store the flashcards in the card holder pages for easy access the next 2 days. 3) Play the CD and follow along with the activities. All lessons are split into more than one CD Track to make it easier to repeat information without listening to parts of the lesson you don't need to hear again. One consistent activity involves placing the flash cards picture side up in the order they are listed in the manual. Then the children will touch the card and repeat the word that Senora Gose calls out on the CD. My kids loved flipping and flopping the cards! Have fun creating sentences using the flash cards after listening to the same tracks you listened to the day before. Other activities are recommended as well like the speed test. On the 3rd day you will read from the transcript in the manual. The purpose of this portion is for your child to interact with YOU in Spanish. You can always supplement with additional games, the Flip Flop Workbook or any other curriculum. We did not receive the workbook to review and after seeing my children struggle a little with the program I would highly recommend getting the workbook to help reinforce the lessons. I checked out the sample workbook in the Flip Flop CurrClick Store and it looks fabulous. Lessons take just 10-15 minutes to complete. Sometimes longer if your children are having lots of fun with the activities. My children (ages 6 and 7) are struggling a little with remembering the words so it is taking us about 2 weeks to get through 1 lesson. I am finding that we have to keep going back and reviewing, because they are just simple having a hard time remembering. You will definitely want to make sure that the words are mastered before moving on because each new lesson begins with a review of old words and an introduction of new words. There are lots of great activities included in the curriculum manual and if you need further suggestions there are lots of ideas on the website under Tips and Games. The activities are a fun way to reinforce the new words and concepts that are being learned. My kids love the paleta (paddle) pictionary game. They also loved the scavenger hunt game, where I would say a word in Spanish and they would have to go grab the item. Throughout the program your children will learn grammar tips, nouns, adjectives, verbs and more. You will also learn phrases like, buen trabajo, listo, pues, solo tres mas that are written in the manual and spoken on the CD, but not listed on flashcards. The cards and manual both do a great job of breaking down the words phonetically (which is a great help for those of us that haven't taken Spanish classes for ummm a lot of years). Throughout the program you will be instructed to even make your own flash cards for linking verbs, conjunctions, prepositions, etc. We are enjoying See It and Say It Spanish even though the children are struggling. I had hoped we would be further into the program (we are only at lesson 3) by now but I don't want to rush them since they do need to have words mastered before moving on. I am hoping to add the workbook very soon as I think that is something that is really beneficial to the program (at least for younger children). I hope to see the workbook added to the curriculum package in the future. Gwyn, "Me Gusta the Spanish games. I have learned a few words already"
Rowyn, "I like the Spanish flash cards. I like to play the scavenger hunt game." 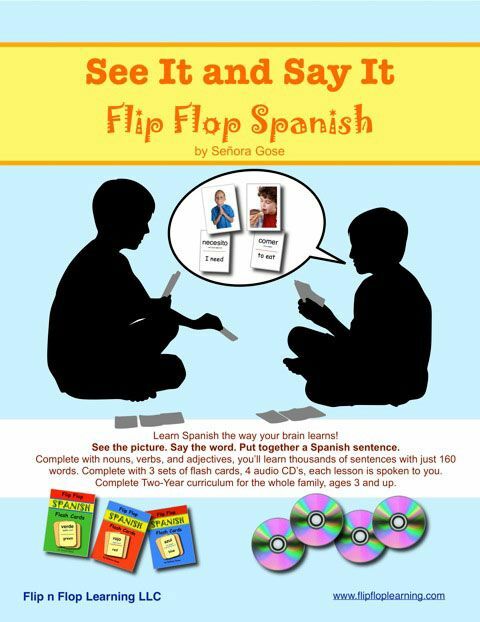 You can purchase the See It and Say Flip Flop Spanish curriculum on the website for $99.95. (Retail $129.95) Orders of $45.00 or more receive FREE shipping! Click here for more See It and Say It from the The Schoolhouse Review Crew. There is a really excellent review! Thanks so much! Thanks for the info on the workbook- I'll check it out! We LOVE board games! One of our new favorites is Ticket to Ride and it is wonderful for geography! Kathy, We are using this and learning a lot as well. You are right, a workbook for review would be a great idea! Go as slow as you need, our experience is that when you take your time, they learn and retain so much more. Great review! This looks really cool! I think it would be really great to have!